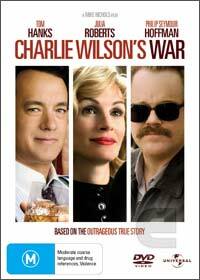 Charlie Wilson's War is based on the true story of Charlie Wilson (Tom Hanks), a United States congressman who through his dealings with the rich, political and the famous, including a beautiful Houston socialite played by the delightful Julie Roberts, changed the war in Afghanistan. Promising to visit the Afghanistan refugee camps on the Pakistan border, Wilson witnessed one of the most heinous humanitarian disaster and vowed to assist these people from their Russian invaders. Turning 10 million dollars into 5 billion dollars, Wilson led the world's most successful covert operation in history as he masterminded, thanks to a renegade CIA agent (Philip Seymour Hoffman) the importation of weapons into Afghanistan which helped end the Cold War. Hanks does a wonderful job at this over the top and eccentric congressman that even though he was under investigation for drug abuse, managed to vindicate himself and changed the face of the planet as we know it which is still having repercussions today. It's witty, smart and entertaining that makes Charlie Wilson's War a truly breath of fresh air in the DVD market at the moment. Presented in 16:9 widescreen with Dolby Digital 5.1, the video and audio quality is perfect and also contains two documentaries which will allow you get behind the movie and inside the head of Charlie Wilson himself.